My first scope was a 60mm refractor when I was just 13. When I was 15 my father and I made a 6" Newtonian equatorial reflector which lasted me for many years. 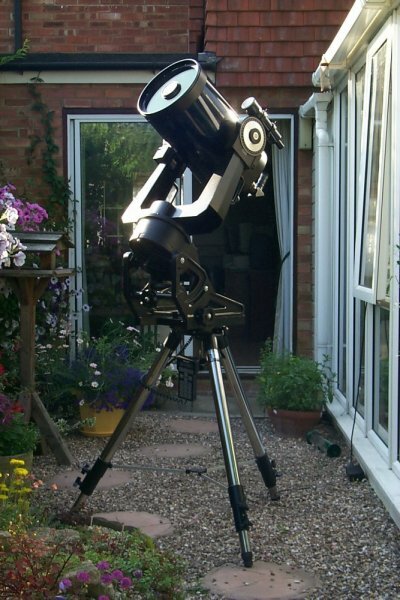 In the early 1990s I bought an Orion Optics GX250 which was a standard Newtonian layout with good quality optics, but needed fairly frequent collimation, as with most Newtonians, and especially if you transport your telescope about as I do. Collimation was trickier with an f4.8 and I would recommend using one of the laser aids now on the market. The short focal length and fast f ratio (4.8) made for a good wide field (over a degree with a 25mm Plossl) and short exposures in photography. Open tubes also mean care is needed to avoid too much dust getting in to the tube and on the mirrors and thus cleaning and realuminising is needed every few years. In 1997 I sold the Orion and bought a Meade LX200 which is a Schmidt Cassegrain scope and has a reputation for being the best amateur 'scope around. The optics are excellent and I found it unnecessary to recollimate the 'scope on arrival and indeed it seems to remain collimated in spite of my carrying it around. Because of this I find high magnification views of the planets better than the Newtonian, although convention would suggest the opposite should be the case. With an f6.3 focal reducer, the field of view is just under a degree with a 25mm Plossl, but I now use a 32mm Televue which gives me a one degree field of view. The whole 'scope is very well engineered and gives the impression of, and indeed is, solidly built. As a result it is also heavy !! The manual says pick up the 'scope by the two handles for setting it onto the mount. I found just carrying it quite a struggle and manoeuvring it up onto an equatorial wedge is not easy, but I am developing extra muscles !! The built in computer and rapid slewing across the sky make it easy to find objects. Once the scope is aligned - in altazimuth mode just levelling and a one star alignment are all that is required - then it will routinely find any of the 10,000+ objects easily. Setting up in equatorial mode is not so easy. The instrument relies upon the main 'scope to align on Polaris, rather than a separate polar alignment telescope. One source of weakness I have found is the assumption that a reading of 90 degrees on the dec axis puts the scope perfectly parallel to the RA axis. This is done by a vernier scale which permits one quarter of a degree increments. At best, you can set this to maybe and eighth of a degree, about 7 arc minutes. This is not accurate enough for photography or finding objects at high magnification. I have found a routine for avoiding this problem which will give an accurate polar alignment, without resorting to the time consuming drift method. See here for details. Another minor inconvenience I have found, working from the UK at a latitude of 51 degrees, also relates to the polar alignment. Once Polaris is aligned, the 'scope slews to a bright star in memory which the manual quotes will be high and near the meridian. This works most of the time, but a couple of times the 'scope has slewed to bright stars barely above the horizon at my latitude - Antares and Fomalhaut are examples, which are only ever low in my sky and in my back garden are always obscured by trees !! I thought at first this would be a real problem, but not so. The easy solution is to accept whatever position the 'scope goes to and then to send the 'scope to another bright star that is high in the sky and do an alignment on that. When I first used my LX200, I was initially disappointed at the RA tracking precision. It was clearly not as precise as the Vixen Polaris mount and periodic error made CCD imaging in unguided mode very difficult, with maximum exposures possible being about 20 seconds. However, the LX200 has a PEC built in and once I had trained this all was well. I have heard of people finding PEC training to be difficult, with the hand controller movement perhaps being too coarse. I did not find this, and using the Meade 9mm Plossl eyepiece with reticle and using short sharp hand controller movement I was able to easily train the drive. Indeed I have only had two goes at this - I am happy with the second attempt which is now stored in memory and applied at all times. With the PEC in operation, RA tracking is superb and I obtain unguided (but driven) CCD images of 3 minutes easily, often obtaining 5 minutes or more without any star trails (at f6.3). Overall the LX200 is a superb 'scope and rightly deserves its good reputation !! 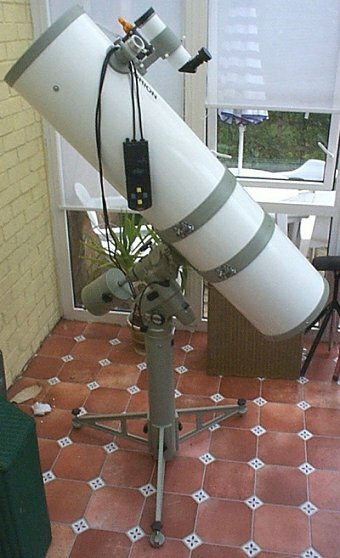 In 2008 I erected a SkyPod Observatory to house my Meade LX200. Click here to see the details ! In 2010 I bought a small refractor, an 80mm Meade APO refractor. I also have a SkyWatcher EQ3 mount and tripod so this can be used in stand alone mode. But the main reason for buying this scope was to piggyback it on my LX200 for photography. In 2013 I bought an 8" Meade LT8 ACF. This is a nice light 'goto' scope, made out of aluminium so easy to carry around, which was my main reason for buying this scope. It is easy to align and finds objects spot on every time. The ACF optics are superb with sharp stars out to the very edge of the field of view.